Hippo, lions and bears loose in Georgia Jump to media player Heavy flooding in the Georgian capital, Tbilisi, has killed at least 12 people and officials are warning residents to stay indoors to avoid animals that have escaped from a zoo. Devastation at flooded Georgia zoo Jump to media player Heavy flooding in Tbilisi has killed eight people, three of the dead were found within the city's zoo. 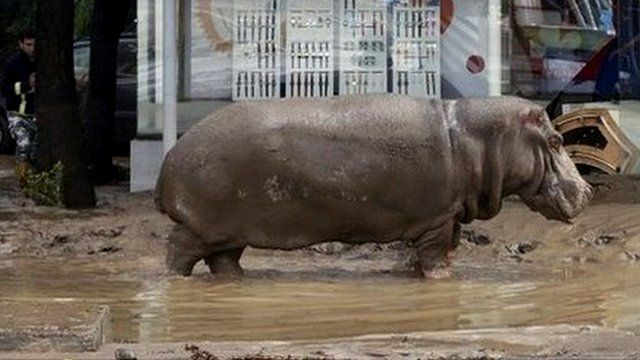 A hippopotamus was cornered in one of the city's main squares and subdued with a tranquiliser gun.